TOM CLANCY’S GHOST RECON WILDLANDS DIGITAL DELUXE for Xbox One is a digital code with no expiry date. Once bought, this downloadable code will be delivered directly to your email address with no shipping cost. We have some of the cheapest TOM CLANCY’S GHOST RECON WILDLANDS DIGITAL DELUXE for Xbox One codes on the market. Our cheap prices are because we purchase digital codes in bulk at a discounted rate that we in turn pass onto you, our customers. Besides being cheap, you can be rest assured our codes are 100% legit as they are bought from official suppliers. Our Live Chat (24/7) and excellent customer support are always available in case you have any trouble or questions regarding the TOM CLANCY’S GHOST RECON WILDLANDS DIGITAL DELUXE for Xbox One code. Our Easy to follow 3-step purchase system contains no annoying forms or surveys to fill out and only requires an email address and a valid payment method, thus making the process of buying TOM CLANCY’S GHOST RECON WILDLANDS DIGITAL DELUXE for Xbox One codes from livecards.eu quick and easy. Buy an Xbox Live Gold Membership from us and play TOM CLANCY’S GHOST RECON WILDLANDS DIGITAL DELUXE for Xbox One online with friends and fellow TOM CLANCY’S GHOST RECON WILDLANDS DIGITAL DELUXE for Xbox One gamers all around the world, enter competitions, make new friends, avail of special Xbox Live Gold Members only offers and much, much more! How to buy Tom Clancy's Ghost Recon Wildlands Digital Deluxe Xbox One? Buying Tom Clancy's Ghost Recon Wildlands Digital Deluxe for Xbox One from Livecards.eu is as easy as 1 2 3! Simply fill in your email address, select a payment method and complete the payment! 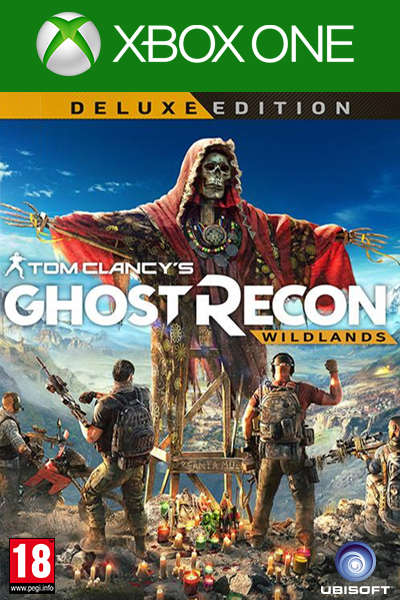 We have some of the cheapest Tom Clancy's Ghost Recon Wildlands Digital Deluxe for Xbox One on the market.